Death and taxes. Neither can be avoided. However, with some clean living, careful choices, and a little luck the former can be delayed. So can the capital gains tax on the sale of your real estate, which happily only requires some planning. The tool to make this delay of tax is known as a Like-Kind Exchange, often referred to as a 1031 exchange, from the IRS code of that same number. As of January 2018, this only pertains to real property used productively in business or held for investment and not personal property such as equipment, vehicles, and other such things. What is a like-kind exchange? Simply put, it is exchanging one property, held for productive use in a trade or business or held for investment, for another property for those same purposes. What it is not? It cannot be used for delaying taxes on real estate which is held primarily for sale, often referred to as dealer property, where it is your business to buy and sell real estate for profit. This will likely be taxed as ordinary income. Pros and Cons – The benefits of using a like-kind exchange are pretty obvious if growing your real estate investment net worth is your primary goal. Reinvesting equity gain which would otherwise be paid to Uncle Sam in capital gains tax, may net a better return on investment. The downside to the exchange can be the lack of liquidity of real estate in general and less diversification of investments. As an example, if a great stock opportunity became available to you, the equity from the property sale could not be used tax deferred to purchase it. Is it complicated you ask? We are talking about the IRS, so of course it is. Nothing worthwhile ever comes easy. There are several types of exchanges and rules such as time to complete the exchange, naming of properties to exchange into, and not directly receiving the proceeds from the sale of the relinquished property, plus many other potential concerns. The process involved in an exchange can take up many chapters in how-to books, so I will not cover all the details here. The good news is, if you are interested in an exchange, there are professionals out there, such as Qualified Intermediary (QI), CPAs, real estate brokers, and attorneys that can guide you through the process. If you think that the like-kind exchange is a possible route that you may take, plan it from the day you put your property on the market. Engage the appropriate professionals that are required to help you. Be sure you inform the buyer of your property about your intentions to exchange in both the property disclosure and purchase and sale agreement. This is not necessarily required but certainly will make for a smoother closing. If you need more information, here are some links to the IRS website and a QI and attorney we have used. The mention of property taxes often stirs controversy among our citizens. The fact is most of us in some way use the services that tax money pays for from educating our children to keeping infrastructure maintained. If you do not agree with how the money is spent get more involved in the process. This post is for those who think they are being unfairly taxed for the property they own in Maine not for a philosophical discussion about the pros and cons of our current tax system. The Maine constitution requires that taxes on property be based on just value and fairness. Just value is usually considered fair market value. Fairness is determined by how all property owners are treated as a group. To challenge a perceived excessive property tax the land owner in Maine has options for relief. A potential option for abatement is to challenge how the tax assessor determined the property's value. Get a copy of your tax card from the town and review the methodology of the assessor. Compare the valuation of your property to a recent appraisal and/or review recent sale data of similar properties. If you see a big discrepancy in current market value compared to the assessed value you may have grounds for abatement. Another option for abatement is to prove that your property is being assessed unfairly. Similar to researching just value, the taxpayer must do research before requesting the abatement. What you need to look for are a number of similar properties with large difference in valuation. The tax assessor is allowed some variations as it is not practical to fully analyze every property in the town every year. To have success you need to show that your valuation is more than the average of similar properties. If just one or two properties are found with slightly higher or lower valuation you probably do not have a case for abatement. If after your review of all this data you are convinced that your property is being taxed unjustly or unfairly you should meet with the tax assessor to discuss the difference. If you can convince them of the error in just valuation or fairness, they may adjust the valuation to reflect your findings. This should be done before the taxes are committed for the tax year as assessors will most likely refuse to adjust any valuations after that date. If they do refuse your request and you are convinced you are right a more formal request will be necessary. If you have been planning to purchase a parcel of land in Maine you have probably heard of tree growth tax status. These are a few common misconceptions about the program that we often hear from potential land buyers and land owners. The tree growth tax law was enacted by the Maine legislature to allow land owners to maintain their property as productive woodland to supply Maine's wood industry. Cutting trees is what this tax law was designed for. As a new owner you will have a few obligations to get the tax benefit from tree growth but it is a relatively simple process. You need to hire a consulting forester who will help you create a management plan, file some forms and then follow your plan. While you do need to follow some rules, the rules allow for the owner to make their own decisions in managing the lands as long as they use sound silvicultural practices. Once a property is enrolled in tree growth tax status you will need to apply for a change of use that will be acceptable to the town but a penalty will be imposed for the change of use. Also, portions of a property can be left out of tree growth at the time of enrollment to allow for penalty free building sites. If you are like many of our customers concerned with having all of their retirement investments tied to the stock market you may want to look into a self-directed IRA. With a self-directed IRA you will be ready to act when you find that Maine land for sale that you know is a good investment. The Individual Retirement Account or IRA has been around for many years as an incentive for individuals to save money tax deferred for their retirement. A self-directed IRA is simply an IRA that gives you complete control over what you invest in. Unlike most IRA's offered by banks or custodians the self-directed IRA can be used for nontraditional IRA investments like real estate, notes, precious metals and many others. Maine timberland, farmland, land with development potential, waterfront and more could be a great diversification to you investment portfolio. The best benefit of the SDIRA is the ability to have control over what you invest in. No one cares more about your retirement than you do. You can invest in what you know instead of letting others have control of your future. You can partner with friends and others on new investment opportunities. Your investments will grow tax deferred. All investments have risk and a self-directed IRA will require you to do your own due diligence to mitigate risk. 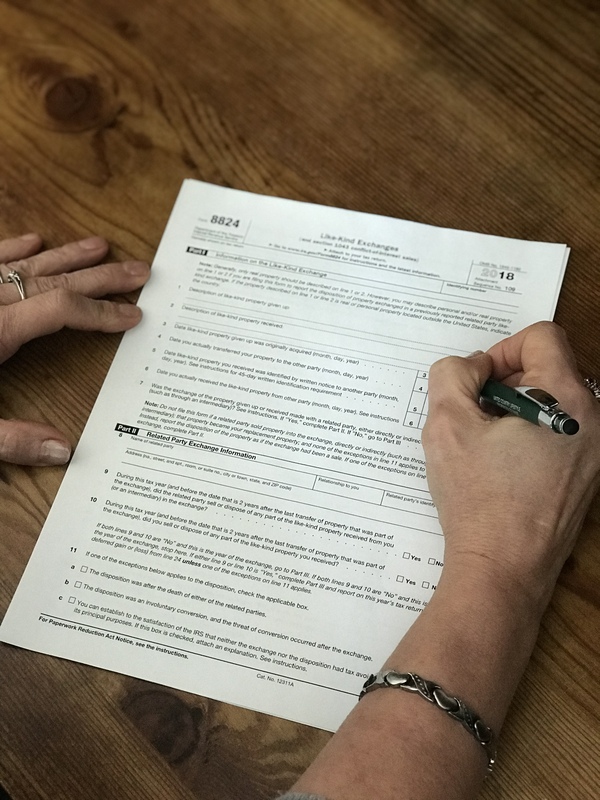 Because this type of tax deferred account could have a lot of potential tax advantages for you the IRS has a lot of rules that need to be followed. You will need to decide if the ability to control your own destiny is something you are comfortable doing. If you do not have time for researching your own investments you may want to stick with a traditional IRA. If you are one of a growing number of individuals concerned with the course of traditional banking and investing, the self-directed IRA is worth a look. Death and taxes are unavoidable but they can be delayed. The former by eating right and exercise and the later by employing the right strategy when selling your land. If you are considering selling your land in Maine and will realize a large capital gain you may want to consider a 1031 tax deferred exchange, aka. Starker exchange. Always consult with your tax advisor but be aware, not all CPA's have a comprehensive knowledge of the exchange process and the tax code involved. One of the most common misconceptions is the term "like kind property". If I sell my undeveloped land, I will need to replace it with another piece of undeveloped land, keeping with the "like kind". NOT TRUE!! The term "like kind" means "investment property" for "investment property". If John Doe owns a 4 unit apartment building in Florida that has been used 100% as investment, Mr. Doe may exchange that property for a timber investment in Maine. As with any topic, you will find tons of information on the internet regarding 1031 exchanges. One company that has been around for years is Asset Preservation. Their web site can be found at http://apiexchange.com and you will find a lot of useful information. Once on their site, click on the button "1031 Repeal Issue". This will allow you to send an email to your Representative asking them not to repeal section 1031 of the IRC. Even if you never have any intention of using a 1031 exchange, the buyer for your property may be involved in an exchange. This type of buyer is motivated and must meet a stringent time table to comply with IRC. "I can't cut any trees if I have the property in tree growth". "I don't want to give up control of my land." "I can't build on the land if it is in tree growth." Once a property is enrolled in tree growth tax status a change of use is possible. A penalty will be imposed for the change of use. Also, portions of a property can be left out of tree growth to allow a penalty free building site.